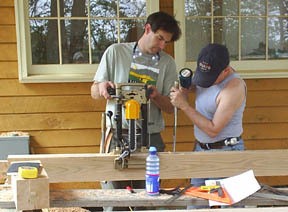 Rick was a student in the March 2003 workshop. 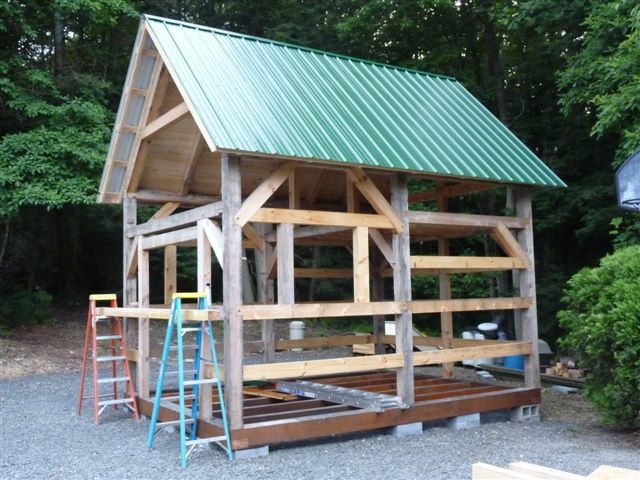 He cut this timber frame by himself out of white pine using the plans that he received from the workshop course. 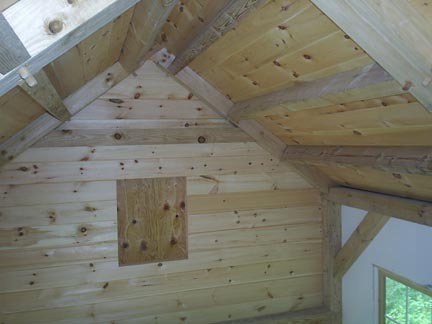 View from the loft area of the timbers and the tongue and groove boards that he attached to the roof and sides of the timber frame. 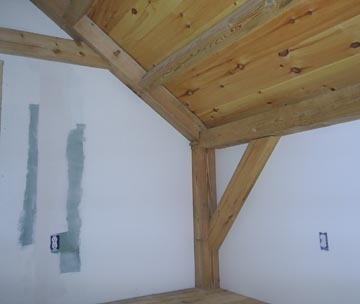 View of the joinery up in the 8' x 12' loft area. 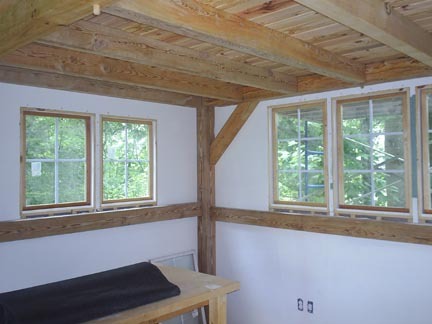 Bright and open area up under the loft, which has a tongue and groove ceiling attached to the timber framed floor joists. 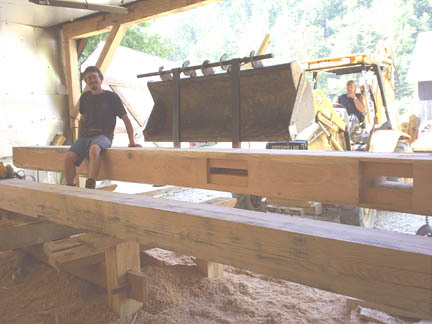 I had the opportunity to stop by and see Rick's timber frame while I was traveling through his town. Nice Job!!! 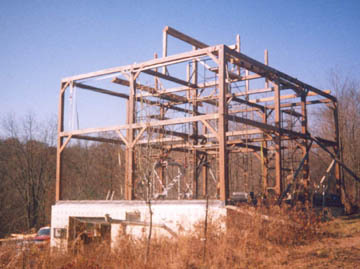 Ed was also a part of the March 2003 workshop. Ed is a true blue do-it-yourselfer! 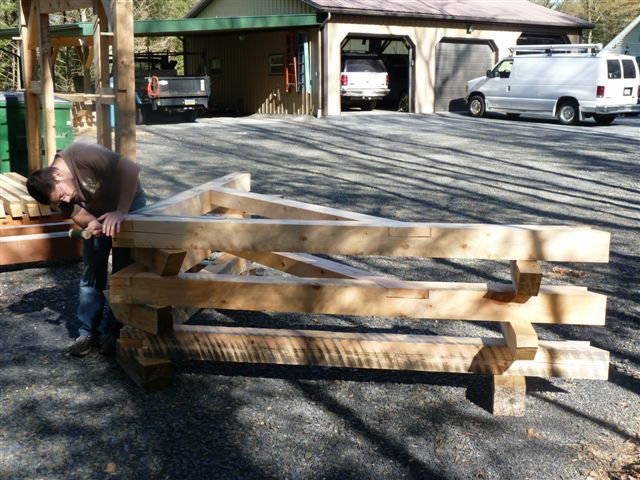 He is building his own timber frame home from the ground up. 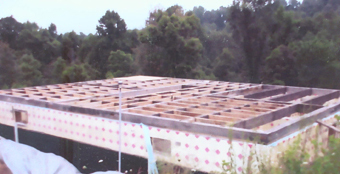 He keeps me updated on his progress and he recently sent these photos of his timber framed first floor that he built by recycling salvaged timbers. 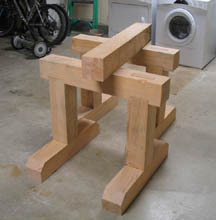 I know the quality of Ed's work and the finished frame will be a beauty! 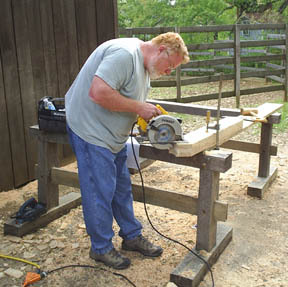 Jeff was a participant in the October 2004 workshop and did a great job with his joinery. 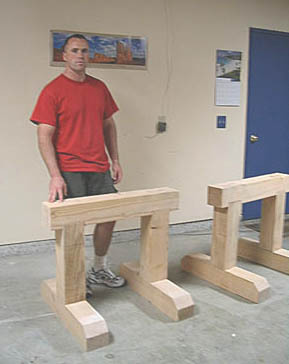 He built these timber sawhorses for those timber frame projects we all are planning in our heads. 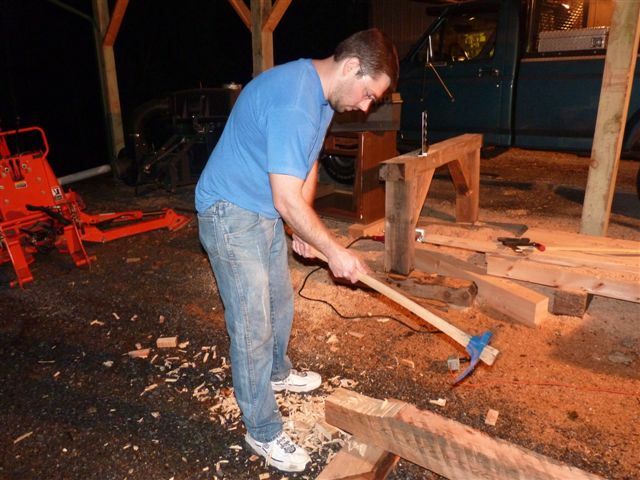 He does not have a lot of room to build in his back yard at the moment, but he has timberframing in his future plans! Click on any of these photos to see more of this project. Luke attended my April 2007 workshop. 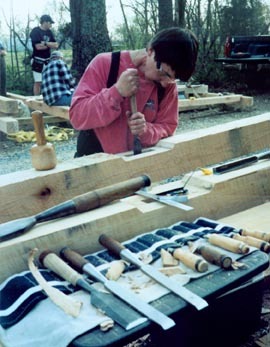 It was not long after that he was back home cutting his own timber frame that is a modified version of my "Timberline" plans. 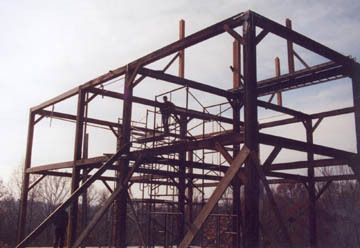 He has his own web blog of his adventure in timber framing http://timbercabin.blogspot.com Luke is scheduled to raise his timber frame in August 2007. 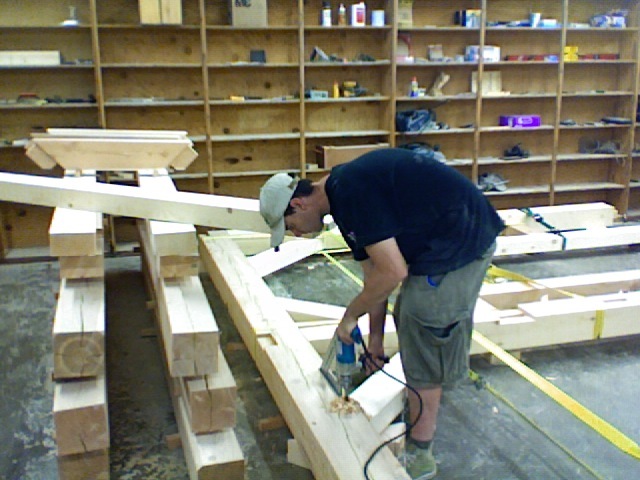 Tim is building a great looking timber frame! 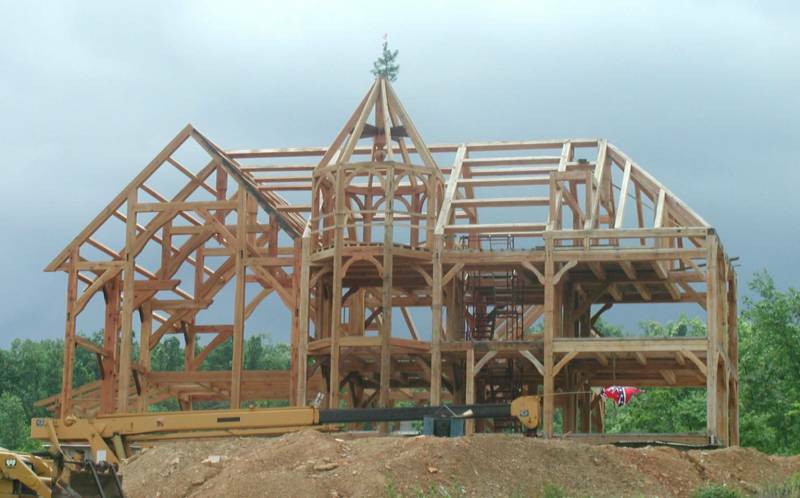 Bill sent me this photo of the timber frame he built after attending a Grand Oaks Work Shop in April 2007. These guys from that workshop must have truly inspired each other. 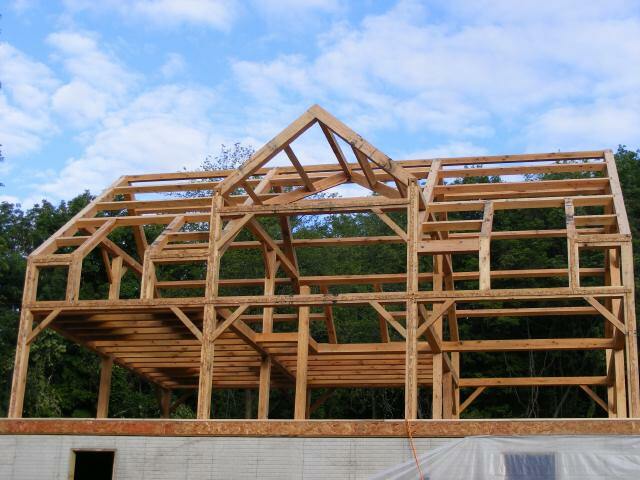 They have been cutting some great looking timber frames. I have joy that I have been just a small part of their accomplishments! 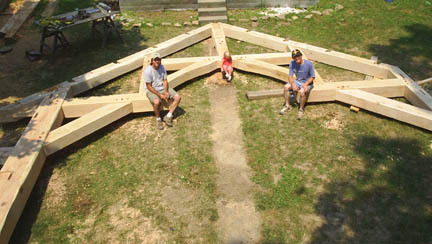 Jason attended my April 2008 workshop and cut this timberframe for his parents based on my "Little House II" plans. 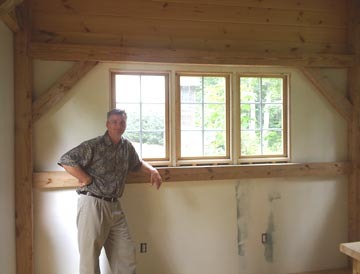 He did a great job and has future plans for timber frames on his own property. 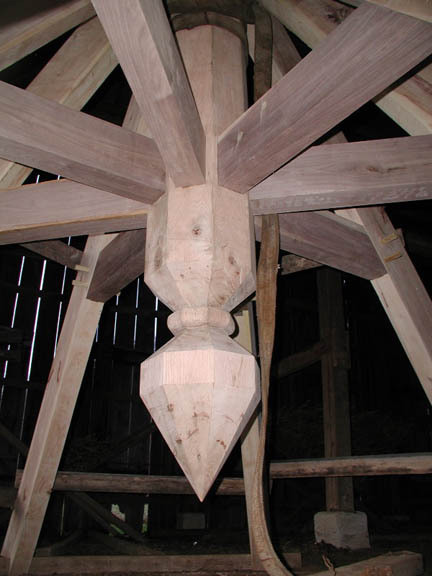 No matter what size timber frame you cut, the detail is in the joinery and you can enjoy the accomplishment that goes into the work that is put into these structures!! 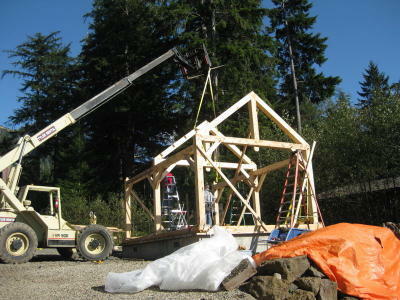 Mike and Rick attended my October 2008 workshop and cut this timber frame that is my Shelterhouse design. 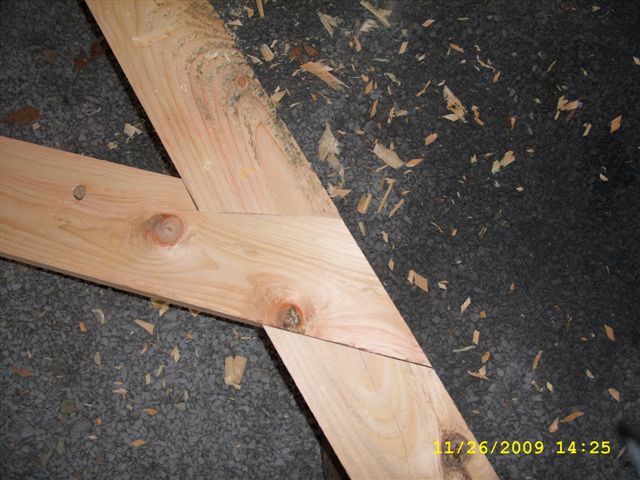 This is the same frame that we cut during their workshop week. 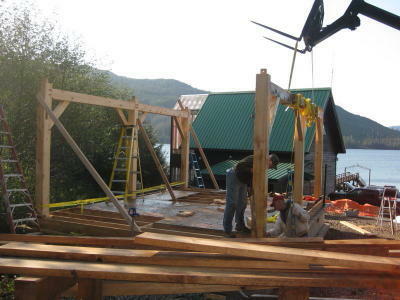 It looks like it was a nice spot to cut a timber frame in Alaska.